The Idaho Beef Council (IBC) is a state agency which operates with a single objective: to increase the consumer demand for beef. Created in 1967 by the Idaho legislature as a marketing organization to support Idaho’s $1.4 billion beef industry, IBC is funded by the beef checkoff program - a $1.50 per head assessment on the sale of cattle in Idaho. The funds generated from this are used to increase consumer beef demand through programs of promotion, research and education to influence beef sales both at home and abroad. An eight-member board of directors guides the Idaho Beef Council. The Board is comprised of representatives from each of the state's industry sectors: Cow/Calf Producers, Dairy Farmers, Cattle Feeders, and Livestock Markets. IBC board members are nominated by their respective organizations and appointed by the Governor for a three year term. As one of the leading agricultural industries in Idaho, the cattle business touches many Idahoans every day - from the ranchers to the processors and plant workers, to delivery truck drivers to restaurant operators and supermarket managers. In the end, it benefits the people who eat it by providing safe, wholesome and nutritious products that fuel our bodies. There are over 9,700 cattle operations in Idaho. As of January 1, 2012, there were 2.2 million head of cattle and calves in Idaho valued at approximately $2.7 billion. Cattle and calves ranked second only to milk in 2012 for all Idaho agricultural commodities in terms of cash receipts. Cattle are raised in every Idaho county, with the largest production in the southern part of the state. Small independently owned operations are still the backbone of the Idaho cattle industry. 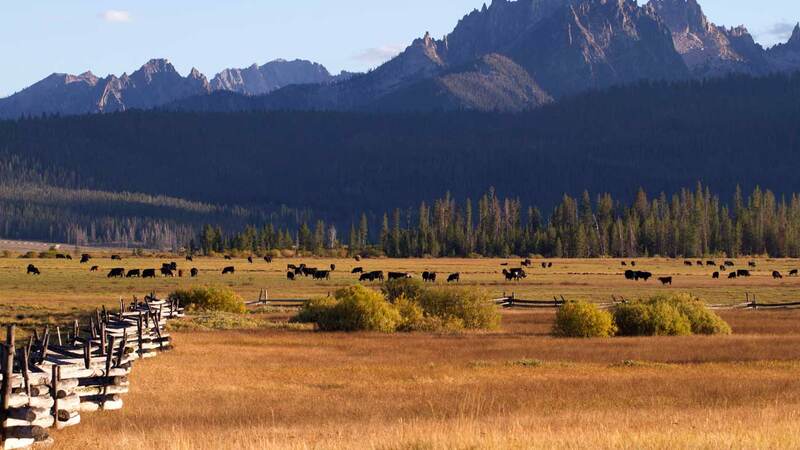 Despite the large holdings of corporate operations headquartered in Idaho such as Simplot and Agri-Beef, the majority of Idaho cattle are raised and fed on privately owned ranches and feedlots. For the most part, beef cows are raised on open pasture. With more than two thirds of the state owned by federal and state government, most cows and calves spend at least part of their lives on public rangelands. Idaho feedlots depend on crop by-products, especially from potato processing operations, to efficiently finish high quality cattle for domestic and international markets.